Prominent & Leading Exporter from Mumbai, we offer danger signages, ansi signs, caution signage, warehouse signs, pedestrian safety signs and caution sign. 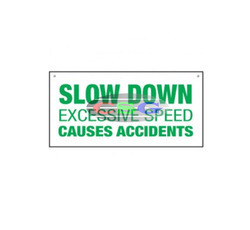 Size 7" x 10", 10" x 14", 14" x 20"
This type of signs uses text as well as graphics to convey the information in a precise manner. 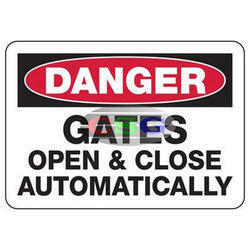 ANSI Signs have an easily recognised format and graphics that are simple to understand. 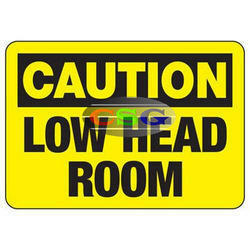 Features Durable Corrugated Plastic signs offer increased bend-resistance. 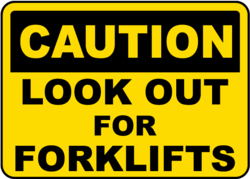 Plant Traffic and Forklift Safety Signs makes sure that there is minimum accidents due to vehicle moving inside a plant. 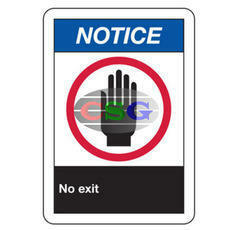 Ensure a full supply of general safety signs is readily available in your workplace. Durable Corrugated Plastic signs offer increased bend-resistance. It includes forklift safety signs and floor markers in one kit which helps in Improving forklift pedestrian safety awareness and prevent property damage with Forklift Safety Kits. Heavy-duty Lexan®-coated floor marker withstands extreme forklift traffic and resists chemicals and solvents. Anti-slip vinyl tape has adhesive backing for quick peel-and-press application. Owing to the support and dedication of accredited professionals, we are able to offer a wide gamut of Caution Board in the market. Wheel chock loading signs are used to ensure that the product is loaded only when the wheels of the vehicle are chocked to prevent its movement. 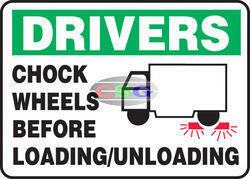 Wording - drivers chock both rear wheels before loading or unloading. Speed Limit signs are used to ensure safety of vehicle when the vehicle is moving through a difficult path or when there is a work in progress on the road. 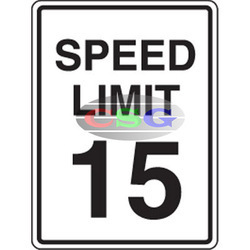 Speed limit 15 signs provide a speed limit for enhanced worker safety. Supplied with pre-drilled holes for easy mounting. Lifetime guarantee available with Duroshield Topcoat. 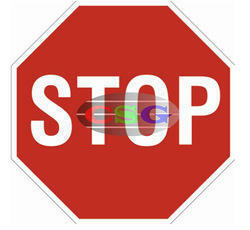 Stop rail sign identifies and informs hazards to moving trains to prevent the accident.Packaged as sign only or sign with clamp kit.Clamp kit easily fastens and is lightweight and secures sign in place. Arm extends upward to hold sign in vertical position. 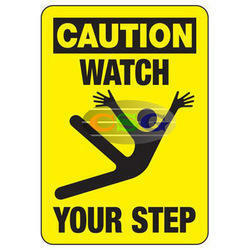 Slipping & Tripping Signs promote slip and fall accident prevention . Available in non-reflective or engineer-grade reflective styles. Optional Duroshield topcoat for added durability and longer service life. Sign reads: CAUTION WATCH YOUR STEP w/graphic. Dimensions 7" x 10", 10" x 14", 14" x 20"
Looking for Warehouse Signs ?